Edwin Starr was a major favourite soul star in the UK in the sixties. Not only were his tracks superb examples of soul at its best but he was also fabulous to watch – he was also a likeable guy. He often use to come and talk to members of the audience after the show and always seemed so optimistic. Both sides of the above single – SOS Stop Her On Site/ I Have Faith In You as well as Headline News were among the most popular tracks in the mid sixties in Manchester. Later the Twisted Wheel DJ back-tracked and obtained Agent Double O Soul imported from the US and blasted that at us. Edwin almost lived at the Twisted Wheel, he was on so many times, or so it seemed. Eventually I Have Faith In You became the most popular track, especially at the Blue Note Club where the pre-allnighter crowd would dance on a Saturday before popping down London Road to the Whitworth Street Wheel. Edwin really made the Soul scene happen, these records are the theme to the mid sixties Mod Soul scene. My Weakness Is You and I have Faith In You were both B sides – the number of times ‘B’ sides used to overshadow the A sides was remarkable. We got our copies of Edwin’s tracks on the UK Orange Polydor label, released before RIC -TIC was bought out by Motown. His pre-Motown tracks mesmerised the Allnighter dancers who pounded their steps into the concrete cellar floors of the Twisted Wheel. The B side of STOP HER ON SIGHT (S.O.S.) – I HAVE FAITH IN YOU BABY, and OH HOW HAPPY and BACK STREET, were played in the original golden era of Soul venues just as much as other, better known, Edwin Starr tracks. He was a frequent and popular live performer in the UK eventually living in Warwickshire. His Motown recordings began in 1968 with 25 Miles, then WAR. Edwin named the Twisted Wheel the HUB of Northern Soul in a Manchester Evening News article about him in 1968 – possibly the earliest reference to the term northern soul ever. Edwin was the last live performer at the Allnighter Twisted Wheel Club on 30th January 1971. This was fitting as he played there so often and the following and had so many associations with the club. The ‘B’ side’s of STOP HER ON SIGHT (S.O.S.) – I HAVE FAITH IN YOU BABY,and OH HOW HAPPY, BACK STREET, were played in the Original Soul venues just as much as other, better known, Edwin Starr tracks. He was a frequent and popular live performer in the UK. Motown recordings began in 1968 with 25 MILES, WAR etc. One of the best soul-shouters to come from the Motown stable, Starr’s style was closer to James Brown than to any of the other male Motown artists. Best known for his 1970 hit ‘War,’ he made a brief comeback during the disco craze, and toured Europe and played the oldies circuit. 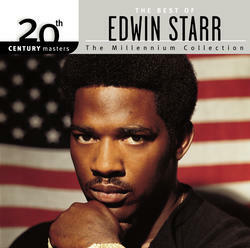 Detroit vocalist Edwin Starr returned to the vocal wars in 1984 when he recorded a tribute album to Marvin Gaye for England’s Streetwave label. He relocated to Britain and moved to Warwickshire. Starr signed with Hippodrome and issued a pair of singles on that label in 1985 and 1986. He then recorded briefly for Virgin, being produced by the Stock/Aitken/Waterman trio, and then recorded for Motorcity in England and WEA in Germany. Starr also had some songs featured on the Walt Disney release Mousersize. ~ Rick A. Bueche, All Music Guide. “War” was covered by Frankie Goes To Hollywood. The closest thing to a bad record by Edwin, in my opinion is: “Oh How Happy” with Blinky. But he did write it. “I HAVE FAITH IN YOU” was simply a mega-monster hit at the Twisted Wheel and Blue Note clubs and even caught on upon the following Soul scene: that Northern thing. Kev Roberts puts it at 406 on his Top 500. There is another version of the song by Doni Burdick, but forget that its a pale comparison to Edwin’s original. “My Weakness Is You” gets into Kev’s Top 500 at 479: beats me. Yes its a fantastic record, but, here’s the ‘but’: He is surely the best of all acts that influenced and launched the entire Soul scene (our in the sixties) at The Twisted Wheel with his great 45’s on that scene which are without doubt “HEADLINE NEWS” and “STOP HER ON SIGHT SOS” and AGENT OO SOUL”. First recording with The Futuretones.